If you’re not in the printing industry, the words “foil flyers” may not mean much to you. But if you’re looking to print a flyer that will stand out in a sea of other printed marketing materials, it’s a good idea to get to know a little bit about foil printing. As their name implies, foil flyers are normal full-color printed flyers that have been enhanced with foil accents. Rather than use harsh chemical metallic inks, many printers have turned to using actual pieces of metal – gold or silver foil – in providing their foil printing services. The choice to forego metallic inks in the foil printing process is not only better for the environment, but also less expensive, as it makes use of materials that are less processed and more accessible than toxic chemical inks. Foil flyers are an option to consider any time you’re looking to add some flair and style to your standard printed flyer. You can incorporate as many or as few foil accents into your design as you desire: some designers cover the entire face of their flyers with foil patterns, images, or text, whereas others use the effect very sparingly as a subtle means to add a bit of sparkle to an otherwise standard flyer. Regardless of whether the project requires intense bling or just a tasteful touch of illumination, foil flyers can create the necessary look, for a very reasonable cost. 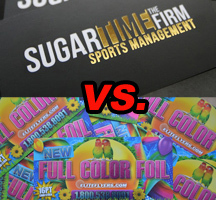 There are two main options when it comes to foil flyer printing. 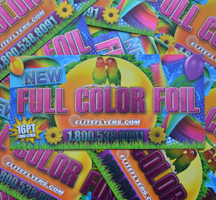 One of the hottest methods that’s currently offered by a select few online printing companies is full-color foil flyer printing. What this technique offers users is the same flashy look that can be achieved by using foil-stamping, a.k.a. basic foil printing, but with the added flair of full color. Printers take high quality dyes and fuse them with pieces of foil that are perfectly die-cut to fit the needs of the flyer design. These colorful pieces of foil are then affixed to the flyer with the use of pressure, in either a cold-press fashion or with the use of heat. Full-color foil flyers, when well-designed, look completely outstanding. They look world’s apart from typical flyers, and your recipients will not only want to act on them, but may actually want to frame them and hang them in their homes as well. Okay, we’re exaggerating, but not by much. If your project requires simple gold or silver accents, there is another method of printing that is slightly simpler than full-color foil printing, and that costs even less as a result. Foil-stamping is the name of the process that produces these bold foil accents, and the method used to achieve it is exactly the same as the one used in full-color foil printing, except there is no need to mix in colored inks with the foil. These foil flyers are a great idea for people who are looking to convey a sense of luxury. They bring the connotation of money and expense, even though they cost the person printing them very little more than a typical flyer would cost! 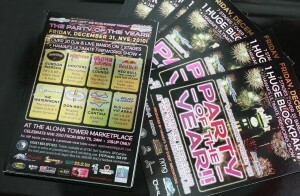 Foil flyers are not useful only to those in the nightlife industry – although they do make a great way to advertise parties in style. But we’ve seen many spas, gyms, retail stores, decorators and designers make great use of this printing style. Foil flyer printing is also an excellent choice for artists, as it gives lends an air of aesthetic beauty and creativity to any flyer. Art gallery openings, festivals, concerts and other special events just look a lot more special when you advertise them with the use of foil accents. If you like the idea of foil flyers, but don’t know how to make use of the technique in your own designs, it’s a good idea to look through some of the flyer design blogs on the web to give yourself a few good ideas. There’s a lot of great material out there, and there are even design templates available for free, so that you can make the best use of this design option, with ease.